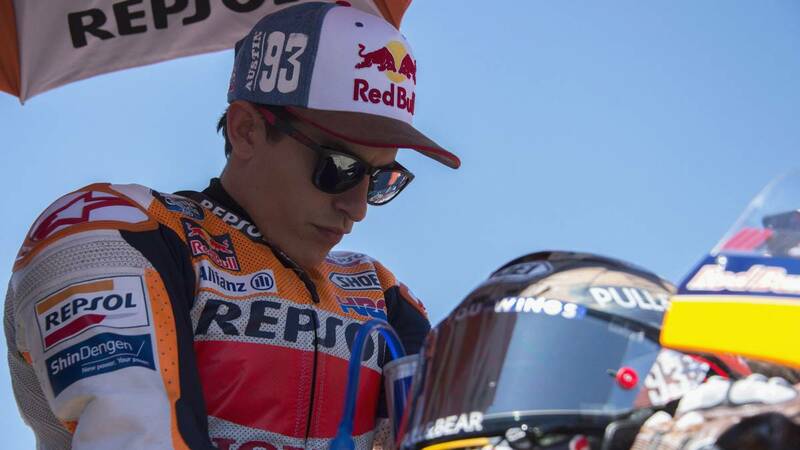 Home Moto Márquez: "I've thrown 25 points"
Márquez: "I've thrown 25 points"
The fall: "I was a little slower, with a little more inclination and less brake, you see the equation and it's not so much, but when you go to the limit you leave when you least expect it". It fell well Marc Márquez the fall in Texas, in turn 12 of lap 9 when he led with 3.9 of advantage over Valentino Rossi, the first of his pursuers. He assumed the error as his own failure and will try to get even in Jerez on May 5. -It gives rage in general, the situation and the fall, but we are human and these things happen and we must be able to admit the error, to know why it has happened, that I still have not understood it, but I will try to understand, to reconsider on it to go stronger to Jerez. Yes it is true that in this circuit I have found myself quite well everywhere and in the warm up we have made another step forward. At the race I was super convinced, with good pace and when I opened a little distance I slowed down a bit and then it was constant. A bit like it was in Argentina, without passing that risk point, but when there are such long braking, many mistakes are seen during the race, which go long. I was very constant and yes it rages, more than points for a circuit where I am comfortable and in which, speaking clearly, I have thrown twenty-five points. -Can you explain in detail how the fall has been? ? -I braked three meters later. At 300 per hour three meters is nothing. Then I was going two kilometers per hour slower, but with two more degrees of inclination and a little less brake pressure. It was a little slower, with a little more tilt and less brake. You see the equation and it is not so much, but when you go to the limit you leave when you least expect it. -Can it be that you missed a day of work? -Everything influences, but work days and laps They have been the same for everyone. It is not an excuse and the mistake is mine since I have fallen rolling three and a half seconds ahead of the rest. I was comfortable, not like other times I was screwed, as in Australia three or four years ago, or other circuits. It reassures me because everything and so the error to a certain extent we cover it by staying only nine points away from the leader and, above all, because we have a very good environment and a dynamic to fight for the championship. -Has it been good for you? Once I won Rins instead of Rossi? -In Argentina I bid for Valentino and here I did it for Rins. More than anything for the championship, since that way everything stays much more even. Rins is one of the candidates for the championship. I said it already in Qatar and will be one of the rivals, so the important thing is that we have fallen leading a race and not being fifth without knowing what to do. I stay with the positive always, trying to learn from mistakes and in Jerez it will surely be better. -I was talking about mistakes on the way to the title and it has occurred. -Yes, this happens, they are things of the sport and that's why I always say that I do not live from the past or the future. In Argentina there was talk that I would win all the races and I would be a champion in the middle of the season and today I made the biggest mistake and 'blah blah blah'. The sport is like that and you have to learn, but that's why I have the group that I have, the people around me that I have, to learn from mistakes and know how to analyze. Making bad blood does not get anything. In Jerez we have the next race and we have to do our job well and forget the race with a great result. -On Thursday Rins said that in motor sport there is nothing impossible, in reference to if you could win here and that's how it has been. Does this failure show that it is human, that it is not invincible, and that here two plus two are not always four? -Claro. I have put on social networks that we are human and that we make mistakes. You have to learn from them and try to improve them. We made a mistake, which has been great, but the sport is like that. A footballer fails a penalty when you least expect it and here you can fall, because we are going to the limit. This is where it is best to manage it. In Argentina I made a perfect race and I won the praise and today I have fallen. -Said in quotes, can it come well a failure like this to keep your guard down? -Well does not come, and less where the 25 points , as the race was, we saw them, but until one crosses the finish line one can not relax. And that does not mean that I relaxed, because it was just as constant so I would not relax. With this error, we continue in the championship and arrived in Jerez nine points behind the leader. -Why has not it been possible to restart the motorcycle? -Well, it was an area with a little bit of climb and the flags have not helped either, almost unbalanced me more than pushing straight. I have not tried it withode my strength, because the footrest was broken. There was one finger of footrest and could hardly have finished the race.